Legends are hazy, and the Milo family’s are no different. 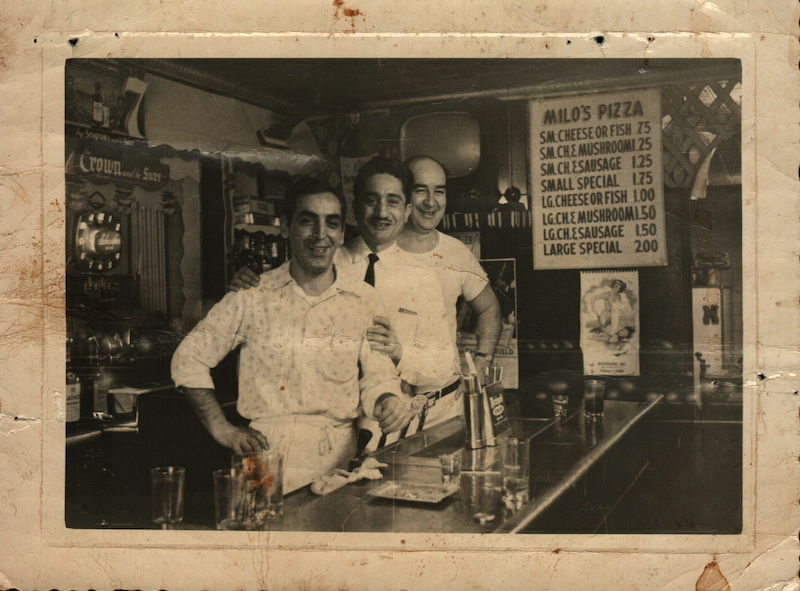 Milo’s great-grandfather — also named Gennaro Milo — had a business partner in 1927, when they first opened the restaurant bar. No living soul knows the name of this bar, but Milo’s aunt swears it was called Bucket of Blood; when the subway opened down the street, they might have changed it to the Subway. The name is irrelevant — blood was spilled. A patron had an issue with the family partner, and they quarreled. The patron ended up dead. Furious, the elder Milo Grandfather took out fistfuls of cash from the register and handed them to his partner. Banished, the man returned to Italy. And so it fell on the shoulders of the Milo family alone to care for the nameless bar that would later become Milo’s restaurant. He remembers when his family finished off the last of the massive, 30-year-old barrels in the 1960s, while he was still a child. But what Milo remembers most is the chill he felt descending the narrow staircase, and the fear of the ghosts who might lurk below. 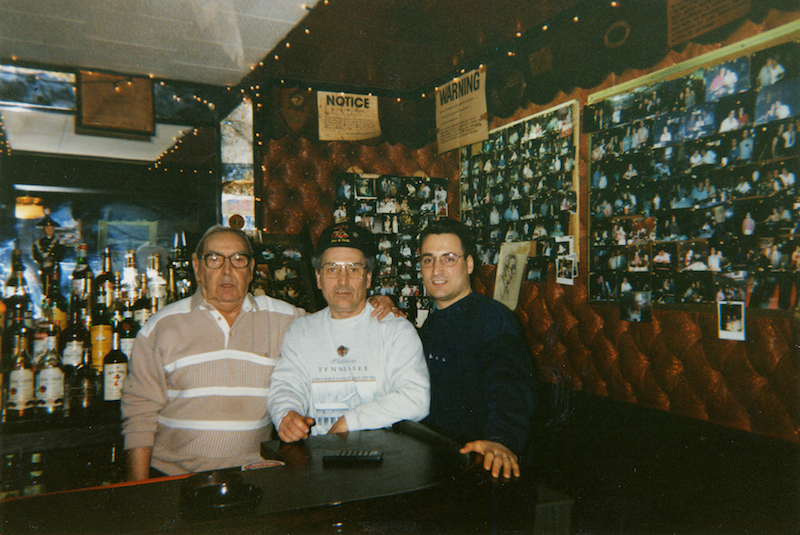 The youngest Milo, whose father (also named Gennaro) moved his family to East New York even as the great-grandparents lived above the restaurant, grew up around the bar, helping out and serving a neighborhood of immigrants — mostly Southern Italians like himself, he remembers. But it was the story of that fallen customer that still haunted him. “He might still be down there,” Milo said. Today’s pricey Williamsburg has sounded a death knell to decades of affordable housing for immigrant communities — namely Italians, Puerto Ricans, Dominicans, and a strong Hasidic Jewish presence. The story of 559 Lorimer is, in some ways, emblematic of the change. The plot, a bar where gay men dance and drink until late in the night, sits under an assemblage of apartments where residents complain if the noise gets too loud. The building’s structure is an index of death, not just for the man whose body might still lie somewhere in the basement, but also below, where an old colonial graveyard sits. Metropolitan Bar, much like the rapidly gentrifying area around it, is filled with spirits. Today, LGBTQ people — and especially gay men — go to one of a few bars around the neighborhood to meet others. 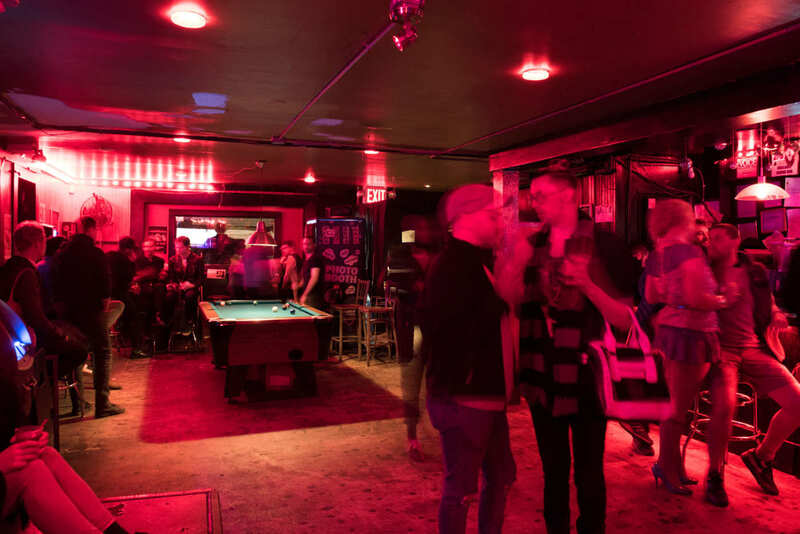 They might go to the bar on Montrose or the one off Union Avenue — but many go to Metropolitan Bar, a neighborhood staple since it opened in 2002. The bar sits near a historic cross-section between the neighborhood’s north and south regions. The former operated as a playground for the rich during much of the city’s history, and the latter became a haven for poor and immigrant communities, especially after the Williamsburg Bridge opened in 1903 and gave access to people who couldn’t afford ferries between the island and outskirts on a daily basis. Metropolitan Bar lies on land from Williamsburg’s conflict-ridden beginnings: a settlement where the Dutch clashed with Native Americans. The area surrounding the bar was called Kykout — “lookout” in Dutch — and served as a hill from which settler Jean Meserole could see natives coming to attack. Williamsburg became an important pioneer outpost in conquering the land that would become greater New York City. In 1792, a man named Richard Woodhull bought a great swath of land around what is now Metropolitan Avenue and named it Williamsburgh after the man who surveyed it. Woodhull established a ferry from the end of Metropolitan Avenue to Corlear’s Hook in lower Manhattan. Although his enterprise ultimately failed, it inspired others to later take up that mantle. The area began to grow. In 1827, Williamsburgh became an incorporated village and by 1852, Williamsburgh was its own city. It didn’t last long; three years later, Williamsburg (dropping the “h”) consolidated into the larger city, Brooklyn. The land at what is now 559 Lorimer belonged to a church established by those Dutch settlers. An Old Dutch Reformed Church burial ground sits beneath the east side of the entire block. It was likely owned by the First Reformed Dutch Church of Williamsburgh, which convened officially in 1828 at its first location on South 2nd Street — about a 10-minute walk from the churchyard. The church building was sold after the Civil War ended, but the congregation continued to worship in the area, becoming the Bedford Avenue Reformed Church in 1869. New York land conveyance records show that the land at 559 Lorimer Street was deemed forlorn sometime before the mid-1800s — a city sheriff sold it and the building next to it to a pair of sisters in 1869. The year 1880 began the massive wave of Italian immigration to New York City. Over the next 40 years, nearly four million Italians emigrated to the United States, and most came to New York to escape disease and poverty in southern Italy. The eldest Gennaro Milo and his wife, Maria, fell in with that massive migration. At 23, Milo arrived to Ellis Island from Nola, a suburb of Naples. His immigration record states he was a tailor. His family said he spent the first decades in the United States as a repairman for sewing machines while he and his wife traveled back and forth to Italy. In 1924, they traveled home to Italy for the last time. Three years after their return to the city, they opened the restaurant, the youngest Milo said. It was an ambitious venture. Milo opened the restaurant, which was also intended to be a bar, during the 13-year Prohibition era that banned alcohol. During the day, the restaurant sold sandwiches up front. In the back, though, patrons gambled and drank spirits made illegally by the Milo family. 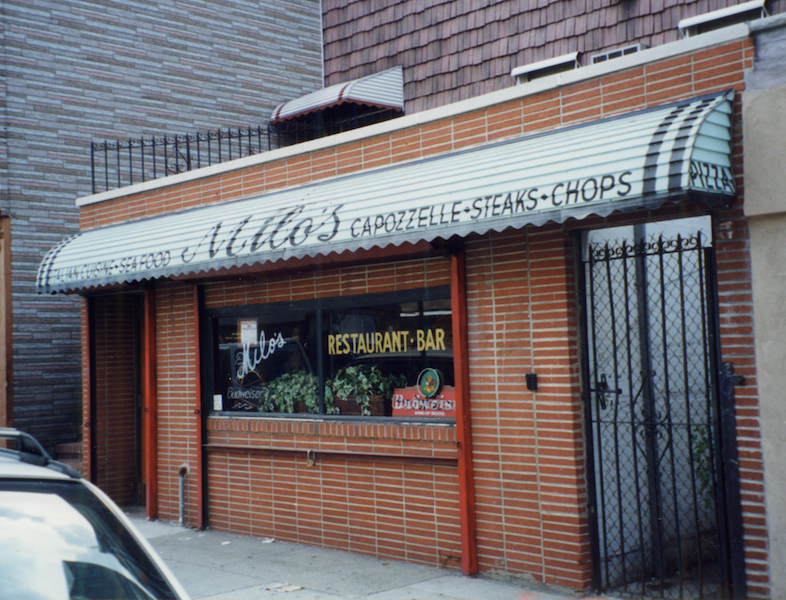 In the 1930s, the restaurant changed its name to Milo’s Restaurant. This might have been around the time that the patron was killed in a spat with the family partner, and that patron might have been named Albert De Silva. De Silva, a 59-year-old man living around the corner on Grand Street, died in a quarrel with his neighbor Salvatore Fariellio on the last day of May, 1935. The New York Post reported the killing as “the second battle between the men of the families within two months,” part of a longstanding feud between them. Both men entered Milo’s cafe — the Post doesn’t name it — with their sons. They hurled chairs, tables and glasses at each other. Someone cut De Silva’s son Richard with a chair. Fariello was slashed with a razor. But De Silva paid the ultimate price — one of the Fariellos stabbed him several times around the heart with an ice pick. In 1945, Milo — son of the bar’s original owner — returned with his brother at the end of the Second World War to take over the restaurant. A decade later, they renovated the bar, bumping out the wall toward the street and granting the building a layout that would later become a lounge under the owner of Metropolitan Bar. Born in 1963, the youngest Milo still remembers exactly what the restaurant looked like when he was a child. When patrons entered the front door, a small room held coats on the left. Past that, a round table and a jukebox sat. To the right, 11 tables held families from the neighborhood — Milo remembers it to have been mostly southern Italian, Irish and Polish at that time — and others from across the city. 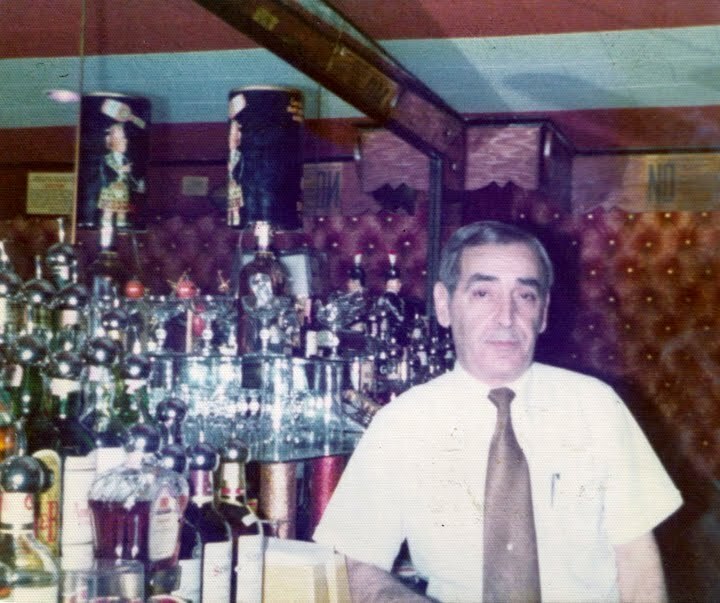 The bar’s heyday lasted until the early ’70s, Milo said, and people always had to wait in line for a table. The bar stretched across the left side of the room, in the same place it now lives. The bathroom had black-and-white tile; it was the “typical New York old style,” Milo said. On the right, the stage where drag queens currently perform was most likely a kitchen — an oven, a stove and a pizza table. As patrons have changed their looks over the years, much of the building has stayed the same. Toward the end of the century, the Milo family had begun their own migration across the country. They sold the bar. A year or two later, the younger Milo drove by to see what it had become, and left laughing. It was an Irish pub then, in the early 2000s, but the name hadn’t changed much: McMilo’s. “It was kind of ridiculous,” Milo said. Although beloved by the Milo family, the restaurant’s legacy is also haunted by darkness — from bar fights with ice pick murders to illegal gambling. As the bar passed through owners, it began to bear witness to that new old violence: gentrification. A few years later, the bar became Metropolitan Bar, one of the few mainstays of gay nightlife in the neighborhood. And as people began to come out in the area, it started to change. Williamsburg began to lead the charge of gentrification in New York City. Young people seemed to move there in droves. In the same week of July 2016, the Bedford stop oversaw the opening of a Whole Foods, then an Apple store. That year, NYU’s urban policy research center reported that between 2000 and 2014, the median rent of Williamsburg had nearly doubled — from $857 to $1,591. The demographic shift hasn’t been the end of 559 Lorimer’s history of violence. In September 2018, two gay men left Metropolitan Bar, turned the corner and were attacked by a 25-year-old man leaving another bar. He hurled homophobic slurs at the victims, punched one in the face and flung another against a tree. The assailant, Brandon McNamara, faces several hate crime charges and up to 15 years in prison. “This defendant allegedly assaulted an innocent couple simply because he perceived they were gay,” said Brooklyn District Attorney Eric Gonzalez. Violence need not be its only legacy of 559 Lorimer: From graveyard to gay bar, the land under Metropolitan Bar has remained a sacred place for those on the margins of wealth and power. As the neighborhood changes, it maintains its sanctity for the gay men who meet there. One of the younger Gennaro’s fondest memories of the land is digging in the backyard, beneath what is now the bar’s patio. The excavation revealed blue and white shards of china — a colorful testament to the people who lived there before his family, in a Williamsburg with slate sidewalks and granite curbs where immigrants flocked to build their lives. It is that spirit, too, that lives on in the land beneath its black wood floors, and with whom men dance late in the night, with a sense of safety from the city around them.